Considering a cruise on the river boats “Vedettes de Paris”? Then book a parking place in advance. Book your parking place in advance with our partners and enjoy your cruise along the Seine in a Paris river launch. 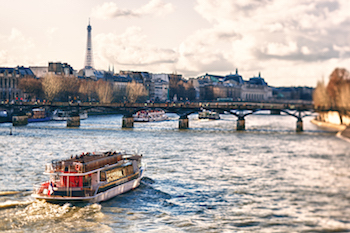 Les Vedettes de Paris offer one-hour cruises, by day or by night, on the Seine. Board at the foot of the Eiffel Tower and discover the most beautiful monuments of Paris, including the Eiffel Tower, Notre-Dame and the Louvre while comfortably seated in one of the modern, elegant boats! Les Vedettes de Paris welcome visitors every day and offer 2 to 4 departures every hour. Fancy a snack during your outing? Each boat is equipped with a bar where you can find drinks and sweet and savoury snacks to suit all ages. With the various options, it is possible to make your trip even livelier or more gourmet without breaking the bank. For example, a glass of champagne or a sweet pancake washed down with a drink (Pleasure cruise), a sandwich or a hot dog with a drink (Snacking cruise), etc. Les Vedettes de Paris also cater for children and have a special theme cruise for them: the “Les Mystères de Paris” cruise. Adult price from €19 to €21 and €8 to €13 for children. Paris river launches special deal: free breakfast on the 1st cruise of the day! (For all online reservations. Further information on the website of Les Vedettes de Paris). For your private or professional functions, consider renting boats or the lounge on the quayside privately. It is very difficult to park near the banks of the Seine. To enjoy your cruise to the full, forget the hassle of parking by booking your parking place in advance on our website! You will also get special rates. The Pullman Tour Eiffel car park , 18 avenue de Suffren, opposite the port de Suffren, right beside the Eiffel Tower and the Champ de Mars. The Castorama Tour Eiffel car park is a low-cost car park in the 15th district, located boulevard de Grenelle, under the DIY store Castorama, 2 minutes’ walk from the Paris River Boats. The Quai Branly Tour Eiffel car park is located under the quai Branly Museum at 25 Quai Branly, 6 minutes’ walk from the Paris River Boats.